Atletico Madrid won the first ever UEFA Super Cup derby 4-2 in extra time as Real Madrid commenced life without Zinedine Zidane and Cristiano Ronaldo. Two amazing goals from Saul and Koke guaranteed victory for Atletico after the match ended 2-2 in normal time. It was Julen Lopetegui's first match as Real Madrid coach and Los Blancos' first match since Ronaldo signed for Juventus. 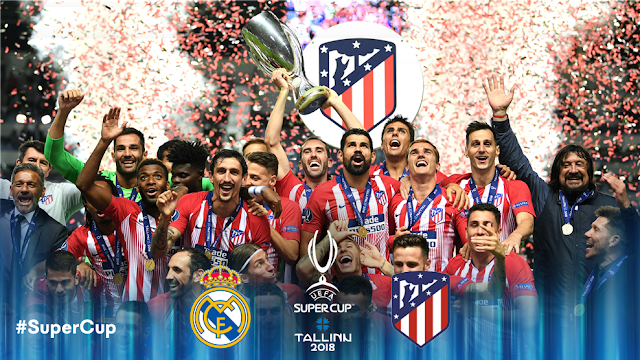 Saul's incredible half-volley and Koke's intelligent finish in extra time gave the Europa League champions Atletico their third Super Cup win in as many appearances. Diego Costa scored the first two goals in normal time, netting the opener after 49 seconds with a screamer and tapping in another after the half-time break. Real Madrid will kick-off their La Liga campaign against Getafe on Sunday, August 19, while Atletico Madrid will visit Valencia on Monday.